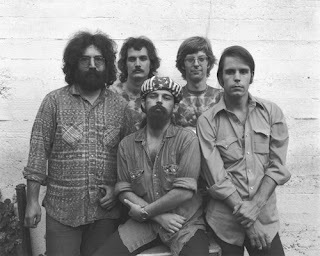 I find myself drawn to the way the world of online Social Networking and the Grateful Dead have been crossing paths of late. I work in the field of Internet Marketing, and thus have an interesting perspective to see both forces at play. Recently, there has been a good deal of buzz around the way folks are twittering set lists while attending the current Dead tour, and the ensuing shock and disgruntled opinions around how this “new age” of communication technology is stabbing the magic of the Dead concert experience in the heart. It seems someone nabbed a complete set list before one of the shows even began, and was tweeting the songs prior to the band playing them, thus bursting the bubble of spontaneity for many folks. Beyond the simple fact that people have a choice whether to read up on these things while en rout to, or while attending a show, it is wild to see how the electronic age version of scribbling a set list down on some paper can stir such discord. The fact of the matter is that we occasionally get more than we bargain for with all this technology. Today, we are all best friends with the guy who snuck a peak at the Dead’s set list before the show got started. 30 years ago, our friend would have emerged from back stage grinning broadly and immediately told us what he saw (this assuming there was a pre-show set list to see back then). We’d probably be thrilled at this window of insight, and then perhaps bemoan his telling us every song before the fact – or be amazed that he was able to remember the entire list long enough to retell it at all. But it would have all happened between perhaps a half dozen people, tops. Today, the pack of friends he tells is every human being who happens to be tuned in online. Now, instead of a few of us talking about this event, hundreds (thousands?) of us are amazed to find that we even had a friend nosing around back stage at a Dead show, let alone that he crushed all the excitement for those of us in attendance who thrive on the spontaneity of the band’s performance. These are just the growing pains we suffer as we mesh our Grateful Dead community into the ever-evolving digital age. 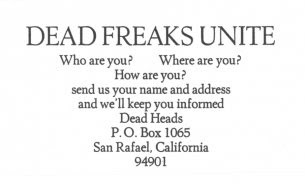 In some ways it’s not unlike the bitterness many deadheads felt when every single show turned up online, making the music that took some of us decades to track down and assemble into our personal tape collections instantly accessible to anyone with an Internet connection. It took a lot of years, but we got over it (most of us, anyway), and now the full online digital catalog is just part of life. Today we’re able to sign up for a myriad of communication channels, with the band and with each other, and many of them now flow in real time. But they serve the same purpose as the original – to unite us. While anyone dabbling in these new Social Media tools will attest to a certain level of static noise coming over the channel, it is an interesting vantage point from which to experience the thoughts and goings on of our tribe, especially while there are events (the Spring 2009 Dead tour) going on in real time around us. For anyone struggling to wade into the water because of the sense that this information comes too quickly and from too many angles, it’s actually possible to clear away some static. First, you should accept that you’re going to miss stuff. You can’t keep up with all of it, so don’t rank the experience upon how much of the information you can consume. You can also impose a little filtering. With Twitter, for example, it’s possible to search tweets with an imposed theme via hashed keywords like #GratefulDead, or #TheDead. Check it out. It’s a little better than pouring though what seems like mindless noise, although there’s plenty of noise even within a themed search. As things like Twitter stick around, the ability to filter will only improve. There are many third party apps out there helping as well. So, while the new world of Social Media catches many of us off guard, we should try to avoid rash decisions related to its value. It really just points to another skill we need to develop – learning how to best make use of our tools, even if that skill turns out to be the talent for dialing down the constant drone of Dead noise to an acceptable level. As we’ve seen with the evolution of audio technology, all new gadgetry needs to be accepted, learned, and adapted to best serve the community. We screwed up CDs big time when they first flooded into trading circles. For those of us who were there, we have countless piles of drink coasters made from Track At Once (TAO) burned discs with two second gaps between our Scarlets and Fires, and endless Sector Boundary Errors (SBE) leaving those annoying little blips between tracks. Eventually, we figured it all out, got over it, and wove the technology into our community. Thank goodness the price of blank discs plummeted so continually. Eventually more and more technology will come along making the stuff we struggle with today seem completely normal. I eagerly await the day I can re-master all of my AUD transfers into some new holographic simulator that allows us to go back and feel like we are actually sitting 10th row center while Jerry and the boys play their hearts out in front of us. We’ll go to shows together without leaving the house. And yes, there will have to be a holographic parking lot scene with every show too. I'll be 50 this year, but I've always worked in some capacity with technology. I felt really old when someone mentioned twitter and I didn't have clue! I only recently got on the Facebook bandwagon, and I'll probably never understand MySpace. As far all things Dead, I love it. My first show was in Hampton 1982, I still feel late a late-comer! Between the GD hour, the archives, various torrent outlets, I now pretty much enjoy a new GD show everyday. Here it is May 6, and at this moment I'm listening to last nights show from Chicago. Man, technology sure has enriched my life! The key missing ingredient in the "social" networks are real, physical human beings having an embodied interaction with one another. The net is fine for exchanging information, yet it has been said that only 7% of communication between people is verbal, the rest is non-verbal (physical). I believe it is important that we not lose our capacity to relate to one another as complete human beings. At the same time, having access to all these shows has brought a new level of appreciation of this music we love. Very glad to have found this place, I'm always looking for intelligent and passionate discussion about this incredible music. As a long time tape collector (circa 1979) albeit a disorganized one I must admitt that I've bought into the digital age big time with my MP3 player taking the place of my unwieldy and rather disorganized tape collection. I'm one that happens to enjoy the instant gratification of archive.org as well. Anyway, its been interesting to see another take on favorite aud tapes and shows in general, especially in such an articulate manner. I'm looking forward to checking out the shows here I'm not familair with and adding my own 2 cents on occasion. Thanks for providing a forum . I'm sorry, but ay Deadhead bitter about the advent of torrents and the free flow of GD SBDs is just an alien concept to me. I have something like 800 shows sitting on and backed up on 10 different HDs as we speak and I can tell you that, in many ways, the GD were the FIRST true, digital band. SBDing every show, though there really was no point, knowing that these archives might be worth something. It's only sheer luck they taped them all and THANK GOD they did. Get over yourselves and fill in the gaps. God bless the Net, the GD and all the Deadheads! totally relevant post for our times. Im soon to be 49 have had a personal blog for 4+ years and because of write-ups I did on my personal blog, on concerts I attended, I got tapped by a poker buddy to contribute to coventry music as we shared musical tastes. I've embraced twitter and actually tweeted as the show unfolded from the Albany concert. I looked forward to the tweets from shows I didnt attend from tour tweet & the GD organization itself. For those at home they could feel like they were there. And thank goodness for Sirius XM which brought us some of those very shows live. Im also happy that people embraced technology and have loaded video to You Tube and on Vimeo. True, nothing will ever compare to attending a live grateful dead concert. But im now happy to have collected a totally portable backed up itune library full of shows that I can carry on an IPOD rather then cases of cassette tapes or CD's and if the ipods stolen I still have my library! !